Building a Gritty costume for Halloween? Here’s what you need to know. 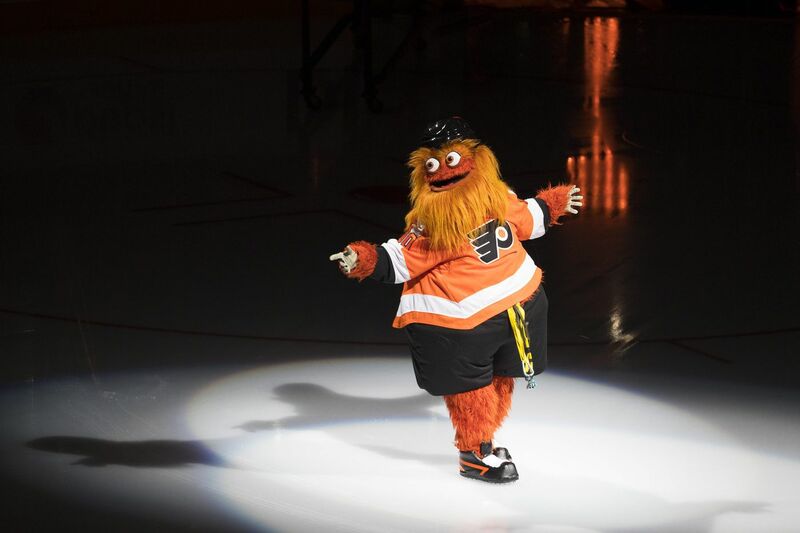 Gritty, the Flyersâ€™ new mascot makes his appearance at the home opener after descending from the rafters before the game against the Sharks on Oct. 9, 2018. It's safe to say that there is one Halloween costume that many Philadelphians of all ages are dying to get their hands on this year: The Flyers' new overgrown-Muppet-esque mascot, Gritty. Unveiled last month to an initially skeptical crowd, Gritty has captured the adoration of an entire city in a shockingly short amount of time. Here are our tips on how to build the best Gritty costume on the block. Because you know, go big or go home. "Before you start, you should take a look at the biggest elements on Gritty," David Raymond, a character branding expert (he created the Phillie Phanatic) who helped as a consultant on the project to create Gritty, said. "There are three things that you can't help but notice about him: The color, the texture of his scruffy beard, and his eyes. I'd definitely focus on highlighting the color and the texture." But in my own quest to build a Gritty Halloween costume, I learned the hard way that the orange fur material that is the very essence of Gritty is in very short supply around Philadelphia because everyone wants to be him for Halloween. "Are you guys making a Gritty costume?" One helpful employee asked me in a Joann Fabric store after I inquired about the availability of orange fur. "Because I just got asked that 10 seconds ago by someone else. It's like how we were out of the Eagles fabric for months after they won the Super Bowl. Everyone wants orange fur." As it became obvious that none of the craft stores in Philadelphia had orange fur in stock, I considered making Gritty's fur from curly yarn, disassembling orange party wigs, and replacing the fur material with fleece. After visits to two Joanns, two Party City stores, and one Michaels, I finally tracked down a pair of fuzzy orange leg warmers for $19.99 that I could fashion into a convincing interpretation of Gritty's beard. But ordering fur online from Fabric Empire, Fashion Fabrics or Etsy is a much better option if you're not pressed for time. One of Gritty's most recognizable traits is that he's a big guy, according to Ardia Dayton, the owner of Character Translations, Inc., the company that built the official Gritty costume. "If I wanted to try to replicate it as best I could, I would try to make the vision out through the mouth. You want the hockey helmet to be sitting on top of your head," she said. Dayton recommended building Gritty's face on a bucket or rolling heavy duty cardboard into a cylinder that fits around your head. I opted for a $7 orange cowboy hat I found at Party City so I could use the brim to capture his signature underbite. (Don't forget a little bit of pink fabric for his tongue.) If you're on a budget, Raymond also suggested gluing googly eyes to a pair of cheap sunglasses and hanging orange fabric off of the frame for his beard. I found 6-inch wide googly eyes online through Michaels, borrowed a Flyers jersey from my colleague Anthony Pino, brought pillows from home to imitate Gritty's shakable stomach, and purchased a black helmet on Amazon for $16. Flyers jerseys cost anywhere from $21.99 in kids sizes to $249.99 for a custom adult jersey through the team's official NHL store, if you have extra change. "One of the greatest props you can use to make yourself really stand out are wireless speakers," Raymond said. "You can clip them to your belt and download a bunch of hockey sound effects like pucks being hit and crowds cheering. It'll really add to the flavor of immersing yourself in the environment." "The other thing is that Gritty has a belly button that squeaks," Dayton said. "You could wrap a dog toy in fabric and tuck it under your jersey." Raymond pointed out that if you're going the googly-eye route — and let's face it, you have to — you should never stand still when you're in costume. "People will think you're really creepy if you're just standing there with those giant eyes that aren't rolling around," he said. "Be aware of that." But most importantly, being Gritty means that you have to commit to performing the character. Don't be shy about busting out your best goofy dance moves. Stir up trouble in the same way that Gritty does. If you do a good job, it could snag you some of those coveted king-sized candy bars.